What is a fancy color diamond? A natural color diamond, known as a fancy color diamond, is first and foremost a genuine diamond like any typical authentic diamond that you have ever seen. The only difference is that these rare diamonds have been blessed with an unusual appearance of color that can range anywhere from pink to yellow to green to brown and even black! 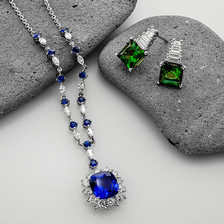 Additional gemstones that have color exist, such as the popular blue sapphire, red ruby, and the green emerald, and attempts have been made in laboratories to add synthetic color to natural diamonds, but neither of these types of precious stones have both the brilliance and natural color of a fancy color diamond. The real deal are only the diamonds that are discovered from the ground exhibiting color in their rough and polished forms! Nature is what gives them their color, which is why so many colors exist. How are colored diamonds created in nature? As strange as it might sound, they are actually grown! The elements are naturally compounded and develop together over a period of millions of years. However, even if we were able to bypass the time, growing a natural diamond still wouldn’t be as simple as a regular potted plant. They are formed only under immense pressure and unbelievable temperatures. Some have found ways artificially create these stones, but although they might be beautiful they are not natural in any way, shape, or form. When did fancy color diamonds become popular? Fancy color diamonds have always been prominent among royalty and the upper class, but they first gained tremendous popularity in the United States with the branding of yellow diamonds as Canary Diamonds in the 1960s and the 1970s. One of the most famous diamonds in history is the blue Hope Diamond. What are colored diamonds made of? A straight colorless unflawed stone is made of only carbon. However, the inclusion of other elements within the compound structure can create some of the most fantastic colors that have been found. Diamonds are made of elements, like carbon, nitrogen, boron, and more, which develop over millions of years under intense pressure and unimaginable temperatures. It is the mixture of different elements that can cause different colors within the stones. Where are fancy color diamonds found? Diamonds are found in limited locations around the globe, and color diamonds are discovered in even fewer places due to their rarity. Some of the most noteworthy sources for color diamonds include the Argyle mine in Australia, where the majority of the world’s pink and red diamonds are found, the Cullinan mine in South Africa, which produces most of the world’s blue diamonds, the Ellendale in Australia, famous for its yellow diamonds, and the Siberia Region of Russia, where there is significant purple diamond production. Where are colored diamonds mined? Although natural fancy colored diamonds are rare, they are found in a number of different mines throughout the world. Some are more famous for their color diamond production, and below are listed some of the biggest names in colored diamond production. Natural fancy color diamonds are made no differently than all the other natural diamonds found. Deep below the surface, at a depth of roughly 100 miles deep into the earth's core, the compound elements develop over a period of millions and millions of years. Colored diamonds aren't found in every diamond mine that exists, and some parts of the world are known for producing certain colors, where other colors are found elsewhere. Where do fancy diamonds get their color? The interesting thing about color diamonds is that each and every color owes its color to a different natural cause. For the most part, various elements and impurities to the diamond's geological structure are the reasons for the beautiful tones found in fancy color diamonds. 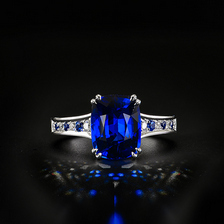 For instance, boron is found in blue diamonds and is the source of its intriguing color. 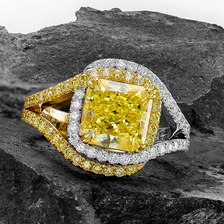 In yellow diamonds, nitrogen is the element responsible for its bright hue. 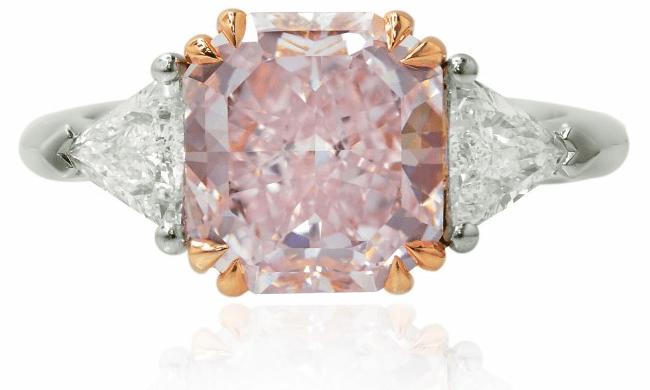 Some color sources are still unknown, such as in pink diamonds. It is largely believed that deformations in the crystal lattice structure of the diamonds are the cause for the pink coloring, but it has yet to be confirmed. How are different colored diamonds made? The elements within the ground that naturally find themselves as part of the stones sometimes cause the most breathtaking colors found. The addition of Nitrogen within the compound structure is the reason behind the strong yellow colors, where as Boron is the cause of a bluish hue. Depending on the levels of each element and how they group themselves, different colors can be shown less or more. 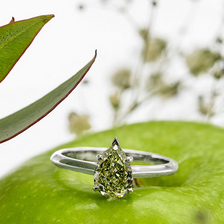 Green diamonds on the other hand actually acquire their coloring from some form of natural radiation. The reason behind Pink, red, and purple colors are still unknown, but scientists believe it is from the immense pressure these stones are in. What colors can fancy color diamonds be found in? Fancy color diamonds come in many colors. They include pink, red, orange, yellow, green, blue, purple, violet, brown, gray, fancy black, fancy white, and chameleon, which are diamonds that change colors. Some color diamonds are known by other names, thanks to their likeness to particularly loveable items, such as Canary Yellow Diamonds and Chocolate, Cognac, or Champagne Brown Diamonds. Both yellow and brown diamonds are on the more common side while pink, red, and blue diamonds are considered extremely rare. How are fancy diamonds graded in terms of color? While in colorless diamonds the 4 Cs equally determine the worth of a diamond, the color is the main factor when assessing value in a color diamond. Therefore, the color grading system of a color diamond differs from that of a colorless diamond. While a colorless stone receives a letter grade from D – Z identifying it on the color scale ranging from colorless (D) to yellow (Z), a color diamond ranges in color from very faint to dark or deep in terms of color, and is also graded based on saturation and hue. The most common intensity levels for color diamonds are fancy light, fancy, fancy intense, and fancy vivid. How many different colored diamonds are there? The world of colors is actually surprisingly large. There are only 12 primary natural colors available. However, rarely will you find a stone with a single pure color. Most stones are found with at least one, or two, and sometimes even three overtone colors. There are roughly 230 color combinations of which you can find in almost any shape, size, or clarity. What color diamonds are the most expensive? In general, the most expensive natural color is red. However, since all the characteristics of the diamond would have an effect on the value, this would only be applicable if measuring diamonds of a similar quality. Although the color will have the greatest affect on the value of a fancy colored diamond, everything, such as the weight, the clarity, the shape, the cut and more is considered. What are the most common cuts for fancy color diamonds? Just like the round brilliant is the preferred cut for colorless diamonds due to its ability to show off a stone's brilliance to its fullest capacity, so too color diamonds have a most optimal cut to best display color, which is the cushion and radiant cuts. Diamond cutters also prefer these shapes as well as other fancy shapes because they display the diamond's color the best. 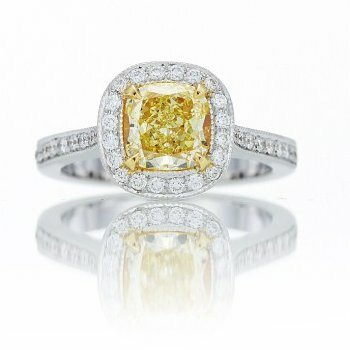 What are some famous fancy color diamonds? Each color diamond category has its own famous diamonds. As would be assumed, the more common the color is, the more famous diamonds it will have than other color categories. For instance, there are many famous yellow diamonds and very few famous red and green diamonds. The most famous color diamond in history is the blue Hope Diamond. Other famous diamonds include the Dresden Green diamond, the brown Golden Jubilee Diamond, the Black Orlov diamond, the Moussaief Red diamond, and the green-blue Ocean Dream diamond. What color do diamonds sparkle? Diamonds in general reflect light, and therefore the sparkle is often just the refraction of light in the room, or surrounding area. The better the cut, the more fire and sparkle will appear off the reflection of the stone. What color are diamonds under UV light? Some diamonds have fluorescence which can actually cause a color as well. Only, this color is only seen under ultraviolet light. Diamond fluorescence can appear in a number of different shades, such as blue, yellow, white, orange, green, and pink. The strength of how much it sparkles can be anywhere from None, through to Faint, Medium, Strong, or Very Strong. What is the most popular kind of fancy color diamond jewelry? The most popular types of color diamond jewelry depend greatly on where the item is being displayed. Among jewelers, rings are the most popular jewelry piece, as there is a soaring desire for unique and rare engagement rings, although they are definitely found in necklaces, bracelets, and earrings as well. Color diamonds at auction houses are generally found set in rings, but are also occasionally set in earrings and necklaces. Are fancy color diamonds going to become more popular in the future? It is impossible to state for certain what the future holds, but it is possible to state at present that color diamonds are extremely rare and will most likely remain incredibly rare. The awareness for these stones is only growing, and with them, their prices, although no new sources of color diamonds have been found or are on the brink of opening in the near future. Therefore, it is likely that the popularity for these magnificent stones will continue to ascend, as supply diminishes and demand increases exponentially.